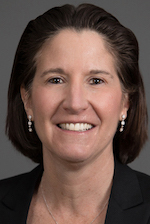 Sue Sgroi is the Chief Human Resources Officer and Senior Vice President of Organizational Effectiveness for Blue Cross Blue Shield of Massachusetts, the largest private health plan in Massachusetts and one of the largest independent, not-for-profit Blue Cross Blue Shield plans in the country. The company serves nearly 3 million members and is rated among the nation’s best health plans for overall member satisfaction and quality. Sue has responsibility for the Human Resources function and organizational effectiveness, with a focus on fostering a culture of continuous improvement that will enable Blue Cross to succeed in the rapidly evolving health care environment. Sue joined Blue Cross Blue Shield of Massachusetts in January of 2015 after 9 years at Fidelity Investments where she served as the Executive Vice President of Asset Management Human Resources. She brings more than 30 years of experience to her role. Her human resources expertise encompasses organizational effectiveness, compensation design, culture change, talent management and capability development, mergers and acquisitions, and leadership coaching across multiple businesses and geographies. Sue has a proven track record of aligning strategic and business objectives with organizational and workforce strategies. Sue has extensive experience within the financial services industry with prior Human Resources leadership roles at Citizens’ Bank and the former Bank of Boston. Sue serves on the St. Francis House Board of Directors, as Chair of the Governance & Nominating Committee. She also serves on the Board of Directors of the Northeast Human Resources Association. Sue is a member of the Human Resources Policy Institute, and the Health Care Human Resources Forum, both of which partner with Boston University's Questrom School of Business. Sue holds a master's degree in organizational development from American University and a bachelor's degree in psychology from Bowdoin College.